Pak John Steamboat & BBQ is affordable and reasonable and definitely I will visit again next time. 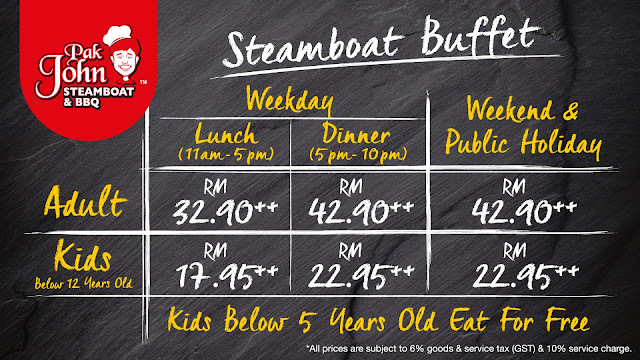 I been told that Pak John Steamboat & BBQ do provides more than 160 variety to be choose. Honestly all the seafood are in fresh and succulent and if you are a seafood lover definitely Pak John Steamboat & BBQ is the best choice. For this round, if you like spicy go for TomYam Soup ( just like us ) but if you prefer original flavour then Prawn Soup and Chicken Soup is highly recommended. Moreover, Pak John Steamboat & BBQ is unique in the sense that they have their own manufacturing plant that supplying most of their frozen and top quality food. I do highly recommended you all to try out their premium (Smoked Duck, Abalone slice, Australian beef slides). Most of their (Pak John Steamboat & BBQ) premium (as mentioned) really served well when you barbecue it and I bet definitely you will love it and wish to have more of it. Not other that, Pak John Steamboat & BBQ also serve have more than 8 types of sauces for you so you able to match and mix. Address : GE-11 Ground Floor, IOI City Mall, Lebuh IRC, IOI Resort City, 62502 Putrajaya.